Here at MOP, we track oyster restoration programs in other regions to learn from their success and travails. One of the areas that we follow is New York and we have found their work particularly interesting since they are working in an urban harbor and have big plans. They have oyster restoration projects underway near LaGuardia Airport at Sound View Park and JFK Airport in Jamaica Bay. In the map below of Jamaica Bay, JFK airport is on the upper right above the green star. 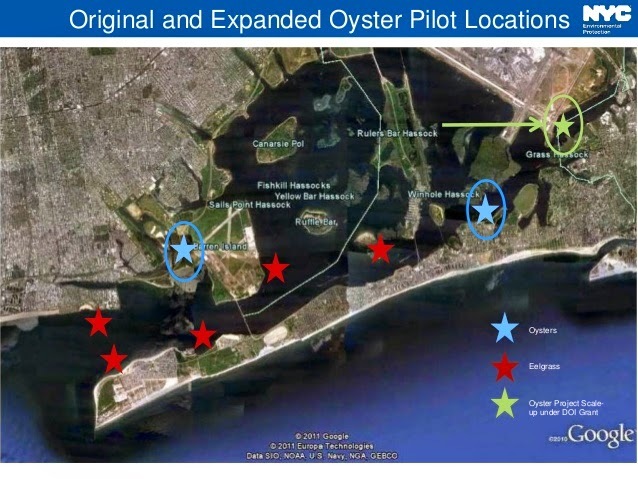 Map of Oyster Restoration Sites in Jamaica Bay, New York- near JFK airport. The map below shows Sound View Park, which is not far from LaGuardia. At this location there is both reef on the bottom as well as hanging oysters for teaching purposes. Map of Oyster Restoration Site- Sound View Park- near LaGuardia airport. It is interesting to see that they are making oyster restoration work in urban environments that are also close to airports. In some ways airport waters could be a very attractive location as access is restricted, which would discourage pilferage- the illegal harvest of oysters. If it is working in New York, perhaps we could make it work here in Boston. We have already reached out to Massport requesting that they require the shellfish serving restaurants, to be required to recycle their oyster shell. Surprisingly, the response has not been very encouraging. To learn more about the Jamaica Bay activity, you can click through the interesting slide show below. There work has some parallels with ours in that surviving oysters do not necessarily lead to successful reproduction. We saw this situation with our discontinued work at the mouth of the Charles.